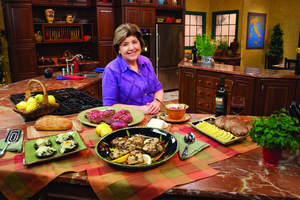 MISSION, KS--(Marketwire - Feb 9, 2012) - (Family Features) Chef Mary Ann Esposito, host of the PBS television show "Ciao Italia," knows all about the joys and benefits of cooking with olive oil. Olive oil is 100 percent natural, contains no cholesterol, trans fats, sodium or sugar. It adds a delicious splash of flavor to any recipe. As a rule of thumb, she says, substitute an equal amount of olive oil for other cooking oils. Extra Virgin Olive Oil: Has a rich, full flavor, fragrant aroma, low acidity and deep greenish-gold color. It's ideal for salad dressings, marinades, sauces, roasting potatoes and dipping bread. Drizzle it over air-popped popcorn for a healthier snack, and use it in Chef Mary Ann's recipe for Marinated Carrot, Caper and Sweet Red Pepper Salad. Olive Oil: Has a rich golden color; perfectly balanced with a mild flavor. It's ideal as a base for sauces and for sautéing meat, poultry, fish or vegetables. Try it in Chef Mary Ann's recipe for Eggplant Rolls. Extra Light Olive Oil: Has a subtle taste and light bouquet, which allows natural flavors of food to come through. It has a high smoke point, which makes it perfect for frying, stir-frying and baking. For a great breakfast, use it to scramble eggs. For dinner, try it in Chef Mary Ann's recipe for Devilish Chicken. Visit www.filippoberio.com and www.ciaoitalia.com for more healthy, delizioso recipes from Chef Mary Ann. To butterfly chicken, place it on a plastic cutting board, breast side down. With kitchen shears or a boning knife, cut along both sides of backbone and remove and discard the bone or save for stock. Turn chicken over skin side up and flatten it by pressing down with hands or a meat pounder. Coat chicken completely with olive oil, then season with salt, pepper and cayenne to taste. Transfer chicken to a dish, cover, and marinate for several hours. This step can be done the day before. Preheat grill. When coals are white or a gas grill temperature reaches 500°F, place chicken on grill, breast side down. Cook, turning frequently, and keeping the fire under control so as not to burn the chicken. About 10 minutes into grilling, begin basting chicken with wine. Continue basting every 10 minutes. The chicken is cooked when a meat thermometer inserted into the thighbone registers between 175°F and 180°F. Transfer chicken to a cutting board, and cut into serving pieces. Serve hot with lemon wedges and a squirt of lemon juice. Use your fingers, not a fork, to eat. Combine all marinade ingredients in a 12 x 9-inch rectangular glass or ceramic dish. Mix well. Set aside. Fill a 12- to 14-inch sauté pan three-quarters full with water. Add carrots and salt. Bring to a boil and cook until a knife tip easily pierces carrots. Drain in colander and transfer to dish with marinade. Toss well. Add peppers and fennel and toss again. Let stand at room temperature for at least 1 hour, tossing occasionally to meld the flavors. Just before serving, toss parsley and mint into salad. Chef's Secret: Purchase eggplants that are very shiny, have intact stem tops, show no bruising or soft spots and feel heavy. Preheat oven to 350°F, or fire up the grill. Brush eggplant slices on both sides with olive oil and place in single layers on slightly oiled rimmed baking sheets. Bake for about 10 minutes, or just until soft. Set aside to cool. Alternatively, grill eggplant slices on both sides until they soften and grill marks appear. Mix oregano (or mint), salt, pepper and pine nuts together in a bowl. Spread a couple of tablespoons of the mixture along length of each eggplant slice, and then roll slices into bundles. Spread 1/2 cup tomato sauce in the base of a 12 x 9-inch casserole dish. Place eggplant bundles in rows in the dish and spread remaining sauce evenly over top. Cover dish with aluminum foil and bake for 30 minutes. Uncover, and bake 5 minutes longer. Serve hot and sprinkle bread crumbs on top.